CARACAS, Mar 7 2014 (IPS) - Seven of the 20 people killed in the street protests that have shaken Venezuela since the second week of February were shot in the head, a testimony to the role being played by firearms in the political struggle in this oil-rich country. The armed forces and the police, and a few thousand licensed civilians, carry legal firearms, but there are hundreds of thousands, perhaps millions, of illegal weapons, according to Amnesty International. The 1999 constitution “expressly forbids the use of firearms and toxic substances to control peaceful demonstrations,” activist Marino Alvarado, of the human rights organisations Provea, told IPS. Who owns and fires the weapons, when some urban areas are shrouded every evening in the smoke of tear gas grenades mingled with that of the burning barricades, and shots ring out, fired by unknown persons from vehicles, mostly motorcycles? The first person to be shot to death, on Feb. 12, was carpenter Bassil Dacosta, at the end of an opposition march in the centre of Caracas. Agents of the Bolivarian National Intelligence Service (SEBIN, the political police) were present – in defiance of an order confining them to barracks, according to President Nicolás Maduro – and so were pro-government members of the so-called “colectivos” (collectives). The second victim, at the same demonstration, was Juan Montoya, the leader of one of the colectivos, who was carrying an identity document issued by the Caracas police. A young model on her first demonstration, a neighbour who was closing the gate of his housing complex as hostile bikers approached, and a sergeant of the National Guard who was clearing rubble from a barricade, were the next victims, in the central states of Carabobo and Aragua. A female student died from pellets fired at point-blank range. Dozens of people were injured by metal or plastic pellets. Policing the protests in more than 50 cities is mainly the job of the Bolivarian National Guard, which is a domestic security corps similar to Chile’s carabineros (militarised police) or the Spanish Guardia Civil, and a component of the armed forces along with the army, navy and air force. The combined armed forces total some 135,000 troops in this country of nearly 28 million people. Within the National Guard, the People’s Guard, created in 2011 by then president Hugo Chávez (1954-2013) for the purposes of surveillance and citizen security, has been very active against the protests. The Bolivarian National Police, created in 2009, is also involved, while by law regional and municipal police corps must refrain from action. Some of these are under the jurisdiction of opposition mayors. But the novelty, found in Caracas and half a dozen cities in the interior of the country, is the colectivos, civilian groups of government supporters whose members, mounted on motorbikes and carrying firearms, have attacked demonstrators, shops, homes and vehicles in opposition neighbourhoods. “The behaviour pattern of these groups supports the theory that they are very probably coordinated with the People’s Guard to act on the margins of the constitution, with their display and use of war weapons,” Rocío San Miguel, the head of the NGO Citizen Watch for Security, Defense and National Armed Forces, told IPS. Some of these groups arose in the 23 de Enero public housing estate in the west of Caracas, from the remnants of urban guerrilla groups active prior to Chávez’s taking office in 1999, and they each control small territories. “They are parapolice groups that control everything from security to the micro-trafficking of drugs and other crimes in their territories, on the margins of state authority, and they shield themselves behind their supposed loyalty to the government,” Luis Cedeño, the head of the NGO Paz Activa, told IPS. After Juan Montoya was killed, some of his comrades in the Leonardo Pirela colectivo in the 23 de Enero housing estate held a vigil over his coffin, wearing camouflage fatigues and balaclavas and carrying fake small arms in their bags. When the funeral procession passed the territory of La Piedrita, another colectivo, it received a one-minute gun salute, with a display of rifles and profuse firing of ammunition into the air. “We don’t have any weapons at this time. But if Venezuelan democracy is threatened by a coup, as it was in 2002, we will bring out our weapons and our hoods. We have the weapons put away. They are in the hands of other revolutionary organisations on the continent,” said activist Alberto Carías. Carías is the president of the Túpac Amaru Revolutionary Movement (MRTA), a splinter group from the Tupamaro Revolutionary Movement, which has spread from 23 de Enero throughout the country as a legal leftwing party giving electoral support to Chávez and Maduro. Opposition groups call the civilian groups that oppose them and dismantle their barricades “tupamaros” or “colectivos” without distinction, and this language has spread through the cities where the protests have multiplied. But the vast majority of colectivos are peaceful neighbourhood groups that support the government, carrying out the government’s social work programmes or developing their own projects, according to research by NGOs and the media. When the protests began, Maduro warned against “demonising the colectivos.” Later, on Mar. 5, he called on them specifically to help combat opposition protests in a speech commemorating the anniversary of Chávez’s death. “I call on the UBCH (Chávez Battle Units, cells of the governing United Socialist Party of Venezuela), on the community councils and on the colectivos: when a candle (of violence) is lit, put it out,” said the president. 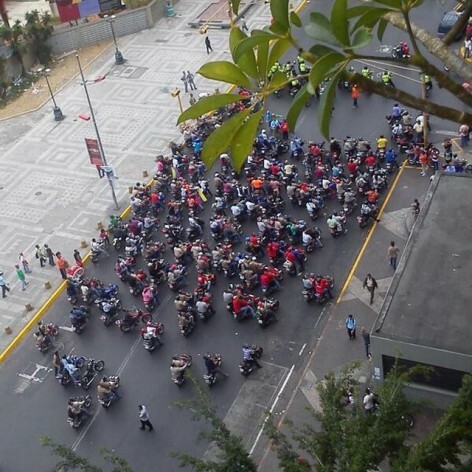 In a matter of hours, groups of civilians on motorbikes arrived to dismantle the barricades that opposition protesters had built with trash bags and set on fire, in Caracas and in cities in the southwest. On Thursday Mar. 6, shots were fired near some of these barricades in the east of Caracas, killing one biker and a National Guardsman, in an example of the violence exercised by the opposition. Retired officers belonging to opposition groups allege that Maduro is calling on these civilian groups because his support among the conventional armed forces is waning, especially in the air force, the navy and part of the army. According to the newspaper El Nacional, two colonels of the National Guard were arrested for protesting against excessive repression.